A practicing clinical psychologist and inspirational workshop leader in private practice in New York City and the Hudson Valley area for more than 35 years, Dr. Kathryn has developed the radically new Visual Centering technique which has helped hundreds of clients to rework neurological brain channels, allowing them to see life, literally, from a more positive, present-oriented perspective. 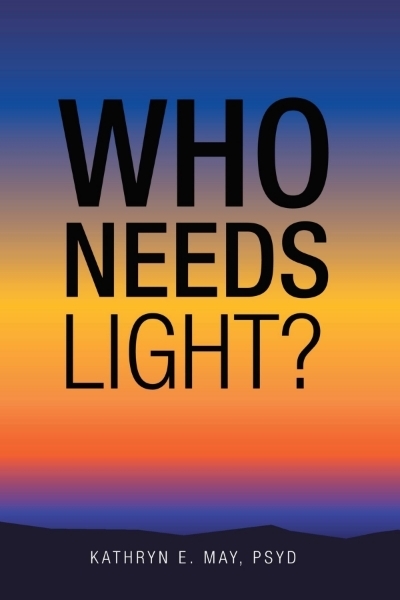 Dr. Kathryn is the author of Who Needs Light? - the book written over a twenty year span of her lifetime. .. the book which caused Dr. Wayne Dyer to say, "Get to know this woman!" And, indeed, today her range of clients has become a global family. In recent years, Dr. Kathryn has allowed the special Gifts she suppressed in her childhood and youth to emerge once more, bringing clarifying Messages from the Cosmos and from the Galactics. During this time of Earth's transitioning, we appreciate all the more the opportunity of benefiting from the timely Information and Guidance brought to us through Dr. Kathryn E. May. Dr. Kathryn has been asked by Spirit to serve as the official "Voice of Mother/Father God." In this capacity she has transcribed frequent messages which have become the journal When God Pinched My Toe. Sananda/Jesus has recently requested that Dr. Kathryn act as his scribe for The New Scriptures which are replacements for Jesus' earlier messages which, over time, became adulterated. Please help us continue! We work from donations!